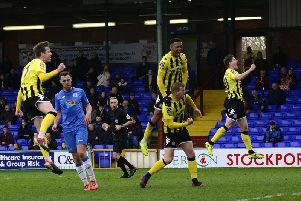 Nick Haughton has no doubt AFC Fylde can win the Vanarama National League title and believes that keeping their FA Trophy run alive can help them in that goal . Priceless victories over promotion rivals Wrexham and Solihull Moors have left fourth-placed Fylde four points behind leaders Leyton Orient, but this weekend brings a break from league action as the Coasters head to Northern Premier League club Ramsbottom United in the Buildbase FA Trophy. And attacker Haughton sees the third-round contest as an opportunity to build their momentum even more, with a quarter-final spot at stake. He said: “I’ve not played at Wembley and can’t really remember getting anywhere near the quarters. Obviously this is a great chance to play at Wembley but that starts with having to beat Ramsbottom first. Fylde return to league action at Maidstone on Saturday week and Haughton added: “I think the next three league games are really important off the back of our last two results. “I think we’ve got a right chance and our team’s good enough to be right up there, so I don’t see why we can’t be aiming for the top. That 2-1 win at Solihull was achieved courtesy of a Danny Rowe brace which took the league’s top scorer to 21 for the campaign. And Haughton said of his fellow forward: “Danny can hit it left or right foot, and crucially when he does it usually ends up on target or in the back of the net.